the destruction and begin the restoration. the tears. I don’t know how this happened. everything was great and getting greater. viewed in light of earth’s survival. as they say, it’s not nice to fool Mother Nature. We try, so, be cautious where you trod. it could also be said she’s more arbitrary. Mother Nature can be quite contrary. It wasn’t always this bad. The animals always anticipated and stayed safe. Our human toll on nature is very sad. she is beginning to take. back in the vipers’ pit. examine him to draw just such a conclusion). who believes the (p)-resident’s every word. mumbling uh-huh, over and over and over. There Was Never a Democracy…. It will be 227 years on December 15 since the Bill of Rights became part of the Constitution of the United States. It has been 242 years since the Declaration of Independence. It only took 15 years from declaring independence to having the completed form of the Constitution. I’m sure it felt like a long time for those original framers in those perilous, tenuous times. In the great scheme of things, how long is 227 years in living under an agreed upon document? A blink of the eye. And so we cannot assume that our democratic republic will remain for posterity. Adam’s words are ominous and we must remain diligent. We, perhaps, are living in the most perilous time to that agreed upon life. What fears draw us to authoritarian rule? What leads us to give up on each other? What draws us from “we the people” to the almighty “I” — when it is “I, I, I, me, me, me,” and not the “community of we”? Have we forgotten that we are all, including Native Americans, immigrants, those who traveled thousands of miles to be here for economic, political and religious reasons — for freedom? Have we forgotten that our uniqueness in the world is our unity in diversity? And so we see there is an emphasis on community through the words such as union, common, justice, general welfare, blessings, etc. But this appeal to our better angels is not referenced nor acted upon nearly enough by our duly elected officials some of whom sell their birthright for a pot of porridge and betray their calling as elected officials for thirty pieces of silver thus advancing the cause of plutocrats which inevitably leads to resentment by the people treated unjustly and a house with an open window for despots to fly through. We do need to be reminded regularly and often that the collective cause is a worthy endeavor to keep in check our personal demon of selfishness that leads to resentment and eventually hate, violence and ends in self-destruction. If we are not to commit democratic suicide, our commitment must go farther than the constitutional guarantees of rights for the individual, to a call for just the opposite (ironically), the self-sacrifice of the individual for the bond of an all-inclusive, diversified, community. And that assumes caring for our constitutional, democratic republic is worth holding off the despotic authoritarians who start by constantly tapping on the window much like Poe’s Raven. The narrator opens the window and the raven flies in, perches on the bust of “wisdom and reason” indicating that wisdom is overshadowed by negativity leaving the narrator to live in the raven’s shadow. That’s bad enough but depots, promising the heaven the raven denied, bash in the window at night (Kristallnacht) and destroy all in the household. Let’s hope and pray John Adams was wrong and act on that hope and prayer to ward off those who now tap on the window and then plunder and to ward off those who come as wolves in sheep’s clothing by exercising our constitutional right of assembling for peaceful protest and, first and foremost, voting. the burning bush sang solo. but i’m giving it a try. but it is still a lot better than hate. few hours sleep, once again come the tweets. daddy, it’s snowing. May I ride Rosebud? My daughter and I have published the Ten P.M. Walk, a collection of my posts and Rachel's formatting. 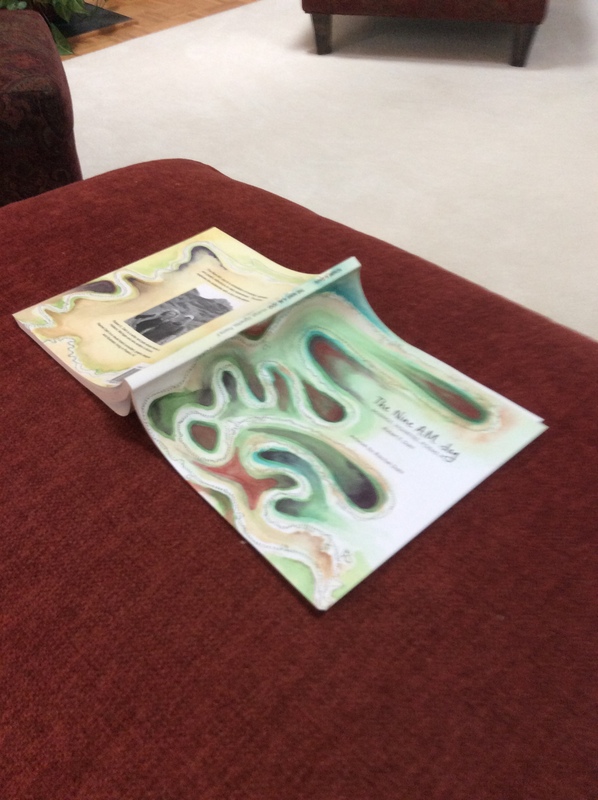 This is a photo of pages inside of the Nine A.M. 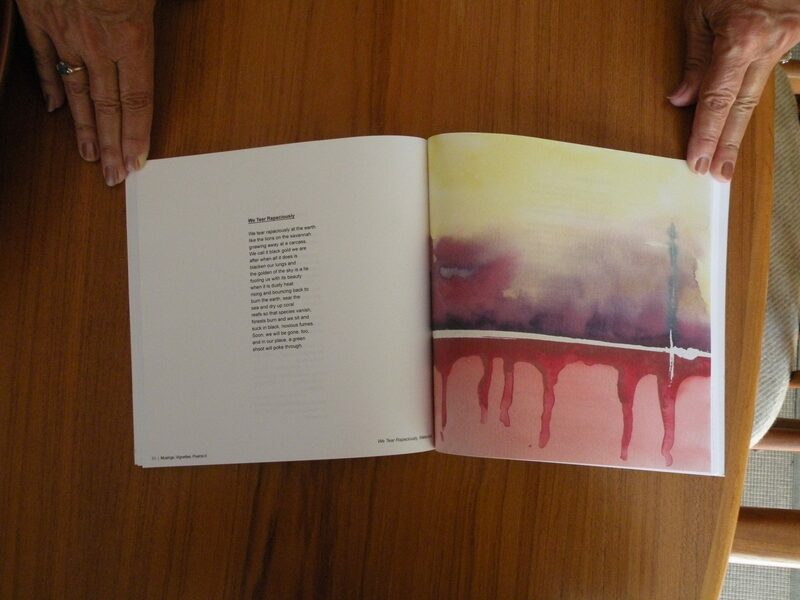 Jog, a book we just published showing Rachel's original abstract watercolor interpreting one of my poems. The Ten P.M. Walk and The Nine A.M. 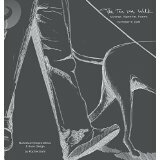 Jog can be purchased from Amazon Books and Barnes and Noble Books. © Robert E. Dahl and bob-dahl.com, 2011. Unauthorized use and/or duplication of this material without express and written permission from this blog’s author and/or owner is strictly prohibited. Excerpts and links may be used, provided that full and clear credit is given to Robert E. Dahl and bob-dahl.com with appropriate and specific direction to the original content.